Maiden Lane--Maagde Paetje in Dutch--was originally a footpath that ran alongside a pebbly brook where the young women of New Amsterdam used to do their families' laundry. It became known as a favorite place for lovers to take a stroll. One-block-long Cortlandt Street runs through the former estate of Oloff Stevense van Cortlandt, a Dutch West India Company officer who arrived in New Amsterdam in 1637 and became a wealthy brewer and the town's burgomaster from 1655-64, until the arrival of the British. Both his sons both served as mayors of colonial New York: Stephanus introduced street cleaning, while Jacobus married into an estate in The Bronx that later became Van Cortlandt Park. 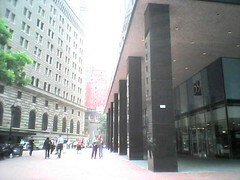 (150 Greenwich St): Here was the nine-story Commodities Exchange Building, destroyed in the September 11 attacks. Like WTC 7, the replacement building is going to have the same address: WTC Tower 4, a glassy, 72-story office tower designed by Fumihiko Maki. 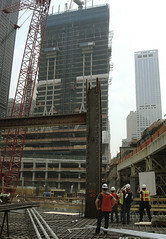 Scheduled to open in 2013, which would make it the first of the new WTC towers to be completed. This building will house the Port Authority's new headquarters, as well as half a million square feet of NYC government offices. 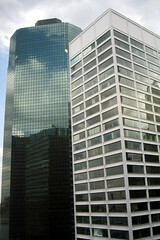 (175 Greenwich St): Richard Rogers' design is for an 80-story building with 2.8 million square feet of office space. It could open as early as 2015--if developer Larry Silverstein can find a tenant willing to commit to 400,000 square feet. 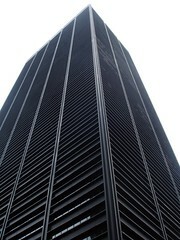 165 (block): A hulk built by U.S. Steel (1971-73), designed by Skidmore Owings & Merrill to show off the client's product--the facade is mainly steel. Owned for a time by Merrill Lynch, it also served as the headquarters of NASDAQ; now houses the Lower Manhattan Development Corporation. 22 (corner): This is the mecca of discount shopping in New York City, where hard-core bargain-hunters elbow each other in pursuit of marked-down designer goods. Founded in Brooklyn in 1961. Currently expanding from four to seven floors at this location, where it was one of the first major businesses to reopen after the September 11 attacks, with its crowds and attitude intact. Corner: Bento Nouvuee sushi. The widow Jane Renwick, a friend of Washington Irving's, the inspiration for Robert Burns' ''Blue-Eyed Lassie'' and the grandmother of architect James Renwick Jr., lived at the corner of Cortlandt and Broadway. Corner (174 Broadway): William Barthman Jeweler was founded at this location in 1884. Barthman (1840-1914), who came to New York as a 12-year-old orphan by hiring on as a cabin boy, was later an lieutenant in Grant's army. 19: This was the address of Elsworth's Boarding House, where James Madison lived in 1787 when he was writing The Federalist Papers explaining and advocating for the U.S. Constitution. Hereabouts was the beginning of the stream that Maiden Lane originally followed on its way to the East River. 29-39 (corner): 2 Federal Reserve Plaza, a 1986 building by Johnson/Burgee Architects. 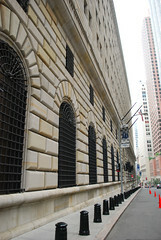 The 27-story structure features turret-like structures at each corner, echoing the castle-like roofline of the Federal Reserve building. 43: Barthman & Straat, the predecessor to William Barthman Jewelry, was founded at this address in 1873. 57: Thomas Jefferson lived at this address for three months in 1790, when he was Washington's secretary of State. The house he lived in was torn down in 1929. 59 (corner): Home Insurance Plaza, a 45-story skyscraper built in 1966 for the Home Insurance Company. Architect Alfred Easton Poor worked in the International Style, with top-to-bottom light-colored columns reminiscent of the Two Towers design. 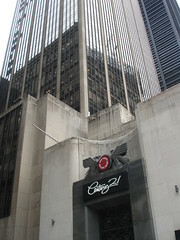 The plaza was redesigned in 1987 by Kohn Pedersen Fox. Loiterers in the plaza are threatened with arrest. 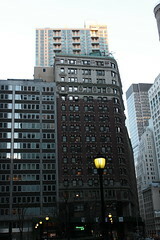 80 (corner): A 1912 building of 25 floors. In 2010, a 250-foot crane fell against the building, damaging the facade but injuring no one. In the building were offices of the city's Department of Investigation, which at the time had been looking into whether corruption at the Department of Buildings had contributed to similar crane collapses that killed nine people in 2008. 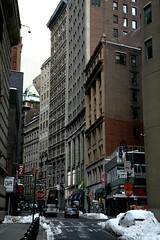 Corner (84 William): A handsome 1907 building of 17 stories, designed by Howells and Stokes. In 1927, it became the offices of Fitkin Utilities, a holding company owned by Abram Fitkin, evangelist turned entrepreneur. Converted to residences in 2001. 83 (corner): A 13-story building from 1958. The NYC Department of Investigation Fingerprint Unit, which checks the prints of people who work in childcare and homecare, is based here. Toloache Taqueria is on the ground floor. Corner (2 Gold): This 51-story high-rise, designed by Avinash K. Malhotra and completed in 2003, is notable for having young, very attractive tenants (according to the readers of Curbed) and a sunbathing lawn on the roof. 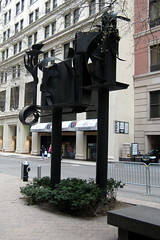 The metal sculpture in the plaza out front is Two, by Gustavo Bonevardi. Corner (211 Pearl): This 28-story apartment building, built 2007, preserves the facade of a Greek Revival warehouse built in 1831 by William Colgate, whose soap business eventually became Colgate-Palmolive. Later in the 1830s, Seth Low had a Far East import shop here, selling Chinese gongs and Turkish opium. It was much later a bar called Rosie O'Grady's. When the rest of the block was torn down, developers were mandated to save the facade and incorporate it into the new building. I'm not against the idea of preserving historic architecture while building modern annexes upon it, but this looks sort of silly. 110 (block): A 39-floor building from 1961, also known as 80 Pine Street, designed by Emery Roth & Sons in the International Ziggurat style. 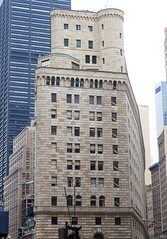 The building is home to Cahill Gordon & Reindel, a high-powered law firm with clients like JPMorgan, Citigroup, Bank of America, Deutsche Bank.... Its most famous lawyer is Floyd Abrams, who defended The New York Times in the Pentagon Papers case and got limits on corporate campaign contributions struck down in Citizens United. There was a fire on the 29th floor here in 2007 that injured eight firefighters. 125 (block): Water Street Plaza, a 16-story building from 1959, designed in an Art Deco/Art Moderne style by Sylvan & Robert Bien. The International Planned Parenthood Federation bought the entire ninth floor here in 2010. 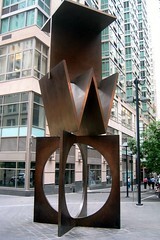 The Lower Manhattan Cultural Council is also here; formed in 1973, the arts promotion group lost its offices in the North Tower of the World Trade Center in the September 11 attacks. Has a cool map of Downtown culture. 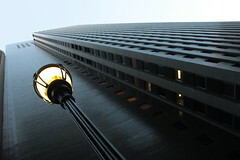 Block (88 Pine): Wall Street Plaza, a 32-floor building by I.M. Pei from 1973, which the AIA Guide calls "a white, crisp elegance of aluminum and glass." Block (160 Front): A seven-story building from 1930--a very short building for this part of the neighborhood. 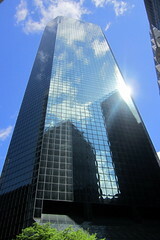 180 (block): A 41-story green-glass octagonal skyscraper, built in 1982 by the Rockefeller Group for Continental Insurance, to a design by Swanke Hayden Connell Architects. The AIA Guide calls it a "tacky green monster." Later occupants have included Goldman Sachs and AIG. A parking lot--seems like kind of a waste of space. A path for bikes and pedestrians that runs along the waterfront from The Battery to 34th Street. What am I missing on Maiden Lane? Write to Jim Naureckas and tell him about it.